In the ancient and medieval times, the cultural and commercial interaction between countries like China, Persia and India from Asia and European nations on the Mediterranean sea coast, mainly took place through a 7000 mile long caravan route. Traders, monks and preachers, nomadic tribes and soldiers on campaigns, travelled on this very same caravan route. Even though the caravans carried all kind of goods, bulk of the trade was of the items like silks, musk, perfumes, jewels and decorative glass. Because of this, the caravan route became known as the 'Silk Route'. This route was in use for at least three millennia. The main silk route started from Xian in Chaina and reached the borders of the Roman empire through Kazakhstan, Iran and Iraq. Another subsidiary or feeder road came to India via Iran and Afghanistan. Number of taverns and water points were built on this route for the convenience of the caravans. A famous Archaeological explorer of twentieth century, Sir Aurel Stein, led three expeditions on the silk route, between 1900-1901, 1906-1908, 1913-1916. Combining the three expeditions, Stein and his team walked about 25000 miles on foot. They crossed places like mountain ranges of Kashmir and Afghanistan as well as deadly deserts of 'Takalamakan’, ‘Lop-Nor’ and ‘Gobi’ number of times. he faced number of life threatening incidences in his travels. Nevertheless, he managed to discover many ancient frescoes, banners, books and other items of significance. Perhaps his most important discovery was 'Magao' or '1000 Buddha' caves near the town of Dun Huang in Gansu district of China. This town was on the old silk route. Stein came to know about the ancient caves hare and befriended the self appointed monk in charge 'Wang Uanlu'. Stein negotiated with this monk and managed to collect a huge cache of banners and document from a sealed room in these caves. In these artifacts obtained from Magao caves, Stein found an old book, which could be considered as the most important or a masterpiece. This book has been printed and published on 11 May 868 (1143 years ago) on a thick and continuous roll of paper. The printing was done by preparing wooden blocks and then pressing these blocks on the paper. 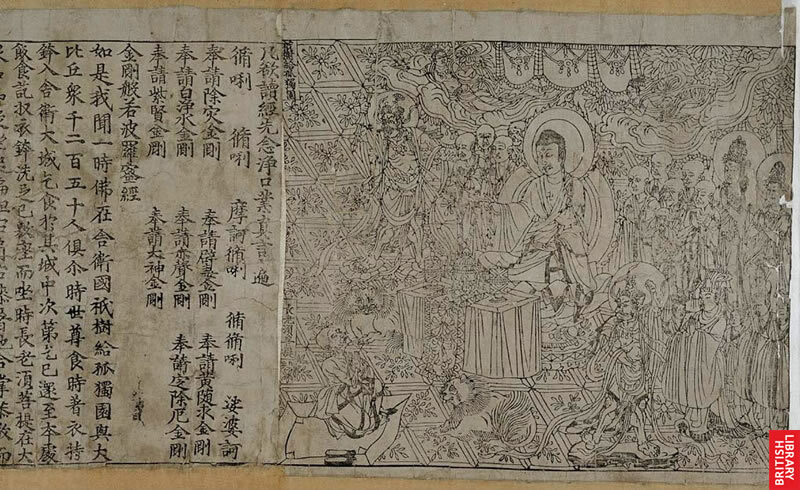 The book is a form of a continuous roll of paper about 16 feet long and contains full version of Diamond Sutra. 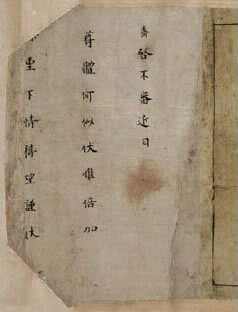 This Sutra is considered by Mahayana Buddhists as perhaps holiest Sutra preached by Buddha himself. In fact the famous Chinese monk, Xuen Zang had travelled to India in AD 520 by a land route to translate and take away with him Diamond Sutra and other Sutra's in their original form. However we can not really say whether the Diamond Sutra fiund in Magao caves is a true version of the book or some curruptions have sneaked in again. At the beggining of this book, there is a hand drawn sketch of Buddha guiding one of his descipals, Subhuti in presence of many other monks. The book,in its original form in Sanskrit, is called 'Vajrachedikapragnyaparmita Sutra' (. 'वज्रच्छेदिकाप्रज्ञापारमितासूत्र ' ). However in short it is known as 'Vajra' or Diamond Sutra. The Buddhists Sutras or hymns were to be rote learned and then chanted. 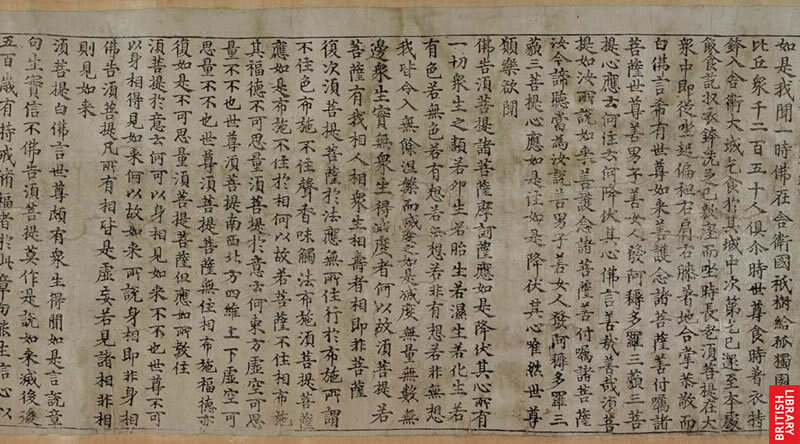 Since these were to be chanted, in the beginning few lines of the text, express instructions were given about purifying the mouth and the body of the monk before Sutra can be chanted by him. A sutra is a sermon spoken by the Buddha. All sutras begin with the phrase, 'Thus I have heard', and then describe the place where the sermon was first given. The Diamond Sutra was originally preached in a park in northern India. The first few lines of text here also report that there was a large crowd present, including over a thousand monks. Among them is Subhuti who asks Buddha to explain to the crowd how to achieve enlightenment. In the first section Buddha explains that learning four lines of this text and teaching them to others would bring Subhuti more merit than if he filled three thousand galaxies with treasure and then gave it all away to the poor. This shows the importance of copying Buddhas teachings in the Buddhist tradition. A central doctrine of Buddhism is that the material world is an illusion, and therefore there are no individuals or objects. This is called the principle of non-duality. And since there are no people or other living beings, there is really no suffering. In this text Buddha elucidates this doctrine by asking Subhuti questions about the 'world'. One of the questions concerns the number of grains of sand in the River Ganges. 'Suppose', says Buddha 'there were as many River Ganges as there are sand grains. Surely, the total number of sand grains in all these rivers would be immense?' But this is a trick question. Sand grains are part of the material world and, as Buddha explains, the material world is an illusion. Really, there are no sand grains at all, just as there is no River Ganges and no Subhuti. In the next section, Buddha names his sermon. He tells Subhuti that their dialogue should thereafter be known as 'The Diamond Sutra of the Perfection of Wisdom'. The diamond - 'vajra' - is a symbol of indestructibility and power over illusion. 'The Perfection of Wisdom' refers to a larger group of sutras, all preaching the doctrine that the world is illusory. Of course, naming the sutra is also part of the illusion, as Buddha points out. Subhuti is moved to tears on hearing this and understanding the Buddha’s teaching. After his return from central Asia, this book was handed over to British Museum as per previous agreement between Stein, Government of India and British Government and has been lying in their collections for last 100 years,. Few days back, British library has made few of such invaluable books available in digital form on the internet. Diamond Sutra is one book from this collection. The original books has been printed on a paper roll and is to be read by unrolling from left to right. On the internet this book is available in form of 5 slides. 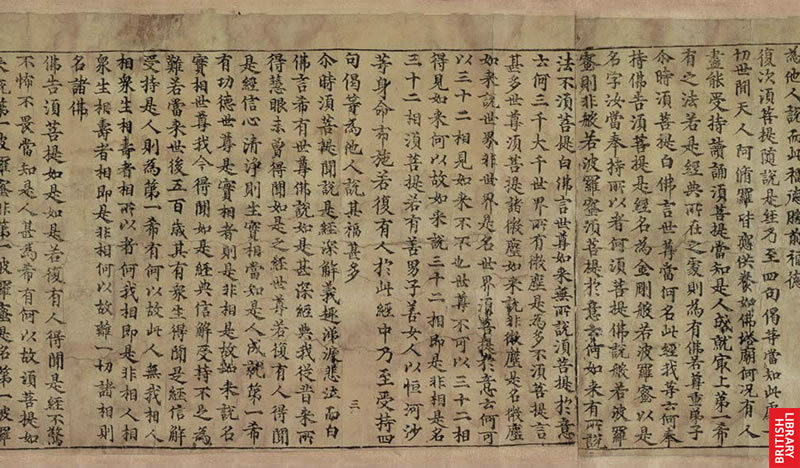 At the end of the book the publisher of the book 'Vang Jie' has mentioned that he has published this book " Reverently made for universal free distribution by Wang Jie on behalf of his two parents on the 15th of the 4th moon of the 9th year of Xiantong [11 May 868]".